Meat free savoury flavour pieces, made with Mycoprotein? Proudly meat free. Deliciously versatile. High in protein. Low in saturated fat. Gluten free. Vegetarian Society approved.Sustainable nutrition Quorn? products contain Mycoprotein?, which is a nutritionally healthy source of protein because it's; high in protein, high in fibre and low in saturated fat. Producing Mycoprotein? uses less land and water than animal protein production, so it's better for the planet too! Remove all packaging - Guide for 1 pack only.For best results Hob cook.All appliances vary, these are guidelines only.Check product is piping hot before serving. Quorn? Pieces are really convenient so you can cook differently with them. Simply heat your sauce (approx. 420g) then add the Quorn? Pieces (350g). Stir, cover and simmer for 9 minutes. Stir occasionally. 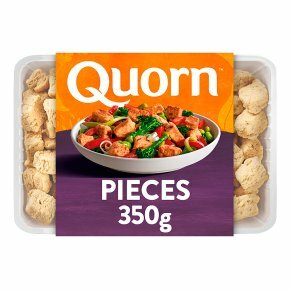 9 MinPlace Quorn? Pieces (350g) in a microwavable dish. Add sauce (approx. 420g), stir, cover with film, pierce and cook at 800w. Stir halfway through cooking. Allow to stand for 1 minute.